Ziba Kazemi, an Iranian-Canadian photojournalist, was murdered by the Islamic Regime of Iran in 2003 while in custody. She was arrested on charges of taking pictures of prisoners’ families who had gathered outside the notorious Evin prison. Ziba was born in Shiraz in 1949 and spent most of her life in France and Canada. She resided in Montreal with her only child, Stephan , who was in his early 20s at the time of his mother’s death. The circumstances of Ziba’s brutal death at the hands of Islamic regime, her courage in confronting the officials, and her family’s five-year battle in launching a law suit against the government of Iran brought international recognition and support – including from organizations such as Canadian Centre for International Justice and Amnesty International, and the worldwide media attention to her case – albeit sparingly. Over the past several years, parallel to the legal battles and above and beyond the media coverage of them, there has been a growing citizen activism around the story of Kazemi and indeed all free spirits like her. Specifically, a group of family and friends who first established Ziba Kazemi Foundation have been tireless in their efforts to humanize the case of Ziba by utilizing artistic means to raise consciousness and familiarize public with the works, life story and character of this passionate courageous and beautiful human being. The most recent event of such nature is a two phase “sound theatre” performance based on the life of Ziba Kazemi, the title of which is inspired by a poem by Forogh Farakhzad- “It is Only Sound That Remains”. 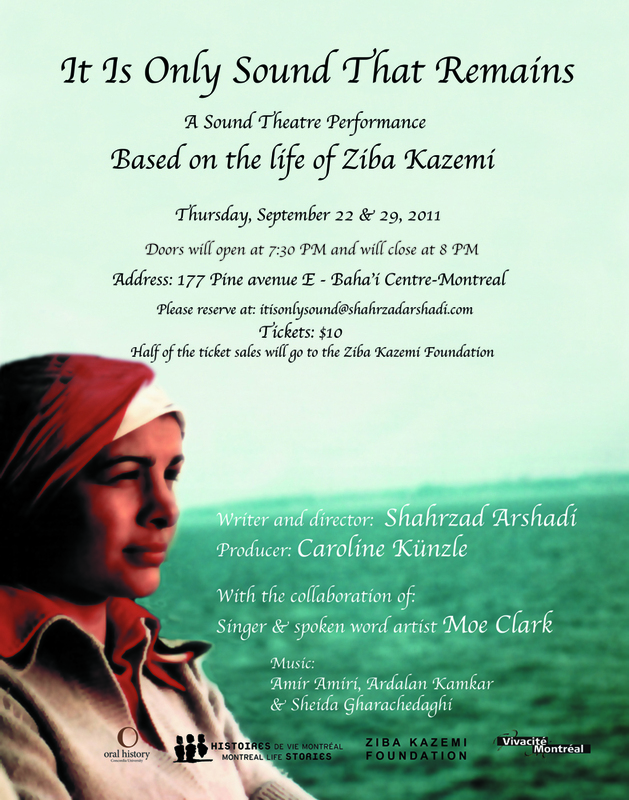 It is co-sponsored and produced by Montreal Life Stories Project, Oral History, Concorida University, Kazemi Foundation, and Vivacite Montreal, to be performed on September 22 and 29, 2011. A simplified version of the same theme (by the same team) was performed on April 2011 – pictures follow. Ziba Kazemi Foundation: This site is constructed by Ziba’s son, Stephan Hashemi and contains an intimate account of her biography accompanied by private collection pictures that Stephan has generously shared with the public. It also contains a series of documentation and articles which gives a chronological account of the events related to the murder of Ziba in Evin prison and the lawsuit against the Islamic republic of Iran that ensued a few weeks later. Perhaps most priceless of all is the collection of pictures taken by this humanist photojournalist and again, generously shred by her son in this site. Left: Shahrzad Arshadi and Stephan Kazemi (Hashemi): The two relentless driving forces behind legal battles and public recognition initiatives. Right: A group of supporters at Quebec Superior Court, Montreal. Estate of the late Kazemi versus Islamic Republic of Iran, March8, 2010. Court Ruling: The decision rendered by Quebec Superior Court was that Ziba’s son cannot sue the government of Iran because of Canada’s State Immunity Act. Governments, that is, are not accountable for the injustices they do, as far as foreign governments are concerned. Here is cbc’s coverage of the ruling. Disappointing as the ruling was, at least waiting to be heard was over and much was accomplished in the process. Many people became familiar with human rights abuses in Iran, they were deeply touched by Ziba’s artistic integrity, and honoured not only her, but all who showed perseverance and courage to fight injustice – pretty much in the same way Ziba herself would.